Fr. Richard Simon, AKA Rev. Know it all, has a thought provoking reflection on the Mass after facing away from the congregation during specific parts of one Mass. Now he wishes that he had not, but not for the reason you might think. And it wasn’t because some people were angry with him. “I, however, wish I had not said Mass facing away from the congregation, and not because of the anger directed at me. I am a Catholic priest. I am used to people being angry with me. I wish I had not said Mass in what I believe to be the posture assumed by the Fathers of the Second Vatican Council, because it was one of the most beautiful experiences of my priestly life. You cannot imagine what it was like to say words like “we” and “our Father” and “us” while standing at the head of a congregation that was turned together in a physical expression of unity. No matter how one might argue to the contrary, it is impossible to say “we” while looking at 500 people and not be speaking to them. I really do believe that, as the good Father points out, that the celebrant cannot pray with the people while facing them and talking at them. And certainly, at specific times during the liturgy, it is preferable for the celebrant and the congregation to turn to the Lord. In the same direction. Oh and I had to laugh at his quip that he “is a Catholic priest. I am used to people being angry with me.” Sadly this is all too true. pastors are confronted, constantly, by people who “get their knickers in a twist far too easily. Father’s post is well worth reading and pondering. H/T Deacon Greg Kandra. 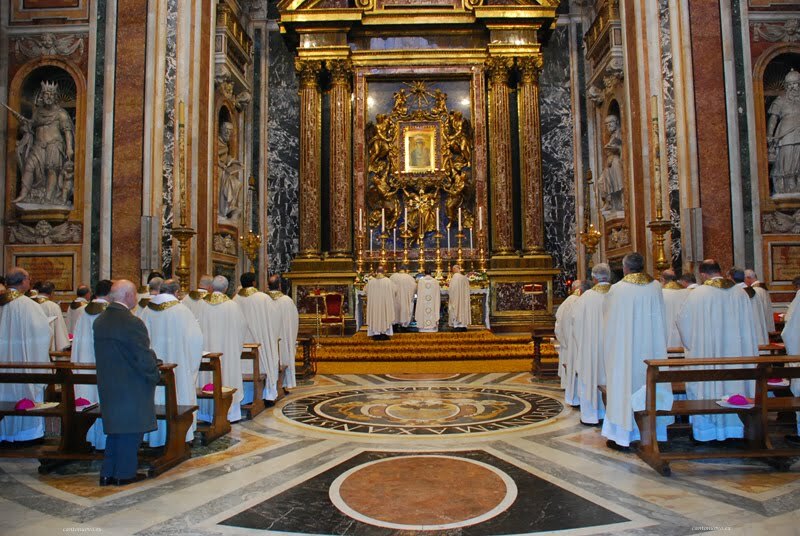 This entry was posted in Echarist and tagged ad Orientem, Catholic Mass, Liturgy. Bookmark the permalink.